Renowned master of psychological thrillers, "no one takes a reader deeper into the heart of darkness". 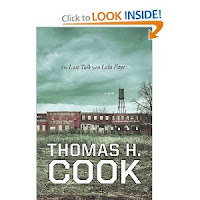 Thomas Cook's latest thriller, The Last Talk with Lola Faye, will be published in August 2010. Thomas Cook has written 22 novels including The Chatham School Affair and The Red Leaves.